WHAT AN ORGANISED LIFE STYLE. I LIKE. This vendor doesn’t only sell baskets and brooms (箒), but also brushes, sieves (笊), ladles (杓) and more, all piled up high on his cart, called a daihachiguruma (大八車). 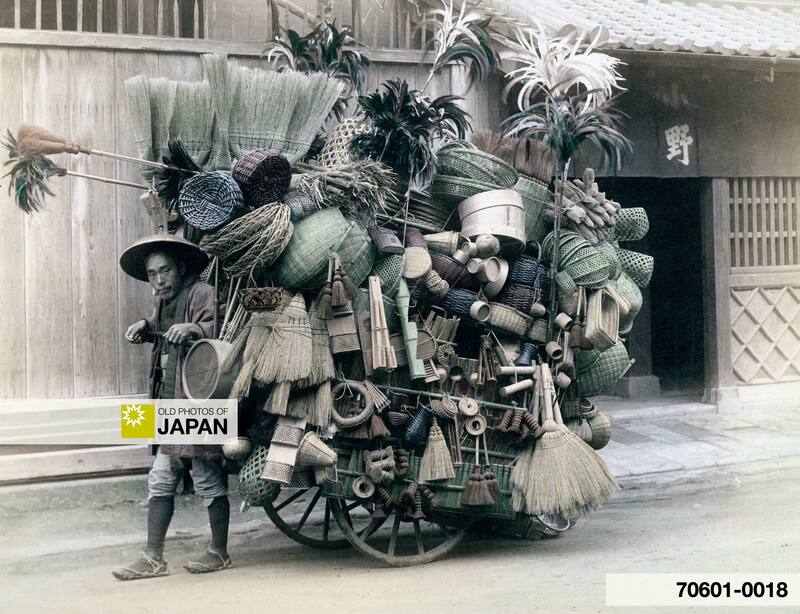 To protect himself from the elements, he is wearing a broad bamboo hat, known as a bachoukasa (バッチョウ笠). Vendors like him used special calls to make potential customers aware of their arrival. You can also licence this image online: 70601-0018 @ MeijiShowa.com. Hi Kjeld. I attribute the above broom seller to T. ENAMI. Have seen it in two of his albums. There is a similar one attributed to Tamamura who took a view of the same guy at a different time, but he is looking a bit away from you — whereas in the Enami image (above) he is looking right at the camera. Really appreciate that. I have already changed the attribution. Some of my most favorite photographs turn out to be by Enami. A nice surprise! Hi Kjeld. Finally nailed the official Enami Catalog number for this Broom Seller print. No.584. After seeing it in several known Enami albums with the number trimmed off (and thus, making the Enami attribution only by repetitive association with other positively ID’d prints), it came as a welcome surprise to finally see it with Enami’s own 584 BASKET SELLER not trimmed off! I notice that in my first comment left back in June 2009, I had only seen two Enami albums. Since then, during the last year and a half, I have seen a few more (bought two, and looked at another owned by someone else). However, the numbered version (finally!) I saw on line (not for sale, and in a collection attributed to Beato). That’s it. Just thought you’s be interested in the 100% solid attribution for the old broom seller who’s looking right at you! I have also seen a similar photo of a woman peddlar . . . Does anyone know of it ? Hi Amy! I don’t remember seeing a photo of a female broom peddler, but I do have a photo of a (very happy) female porter carrying a load of charcoal.